Once again, Modern Drunkard magazine comes through with what we need to know, this time about drinking in the world of Star Trek. 10.) When Spock mind probes him, Spock gets hammered. 9.) Wakes up next to a Klingon chick at least once a week. 8.) Starts the ship’s self-destruct sequence just to fsck with the yeoman who blew him off in the officer’s lounge. 7.) Each time you discover a new planet he tells Spock to scan the surface for cheap scotch and loose females. 4.) He keeps slipping down to the engineering room to “discuss ancient Scottish traditions” with Scotty. 2.) Whenever a female yeoman brings him a clipboard he tries to open a tab. 1.) Is willing to make beer runs into the neutral zone. Go read the rest, it's funny. 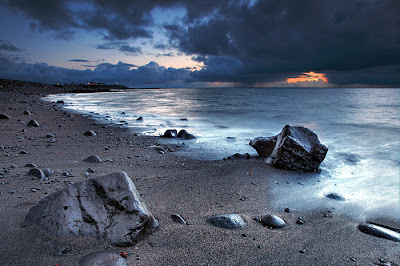 TigerHawk links to an amazing set of photos of the Icelandic coast, by photographer Örvar Atli Þorgeirsson. Some of these are processed a bit. So? It's art. The original set is at Pbase. For laughs, some comments from the German site, Google-translated into something similar to English. "I personally believe that China will be back on the Moon before we are. I think when that happens, Americans will not like it, but they will just have to not like it. I think we will see, as we have seen with China's introductory manned space flights so far, we will see again that nations look up to other nations that appear to be at the top of the technical pyramid, and they want to do deals with those nations. It's one of the things that made us the world's greatest economic power. So I think we'll be reinstructed in that lesson in the coming years and I hope that Americans will take that instruction positively and react to it by investing in those things that are the leading edge of what's possible." The good old American can't-do attitude. Jerry Pournelle says: "Honest, not astonishing: but why isn't it astonishing?" We went to the moon, and then could not think of how to go on. Social programs are more important than the Universe. We could rule the sky, but would rather pass programs like the proposed S-CHIP, which will provide government health insurance to people who can afford to buy their own; or Hillary! 's plan to give $5ooo to every newborn. Never mind defending the high ground, we have enough to do in the valley. This is decadence. Or is it just corruption and …? Considering how much money has been coming into American politics from China in the last dozen years or so, Al Gore and the Buddhist nuns, Charlie Trie, Johnny Chung and the sale of missile technology (dismissive WaPo summary), and of course Norman Hsu, who at this time needs no link, one might easily fall victim to a conspiratorial notion that a portion of America's governing class has sold the High Frontier for easy money. Although it certainly could be just bureaucratic sclerosis. If flying shuttle missions and maintaining the clapped-out International Space Station is all they can think of to do, because they have lost sight of the goal, which is to enable free humans to spread through the Solar System, then they'll keep on doing it till the last shuttle blows up and the space station disintegrates in orbit. Men will go to space; but no law of nature requires that they be Western, or free. We need a Delos D. Harriman, and soon. Maybe Jeff Bezos will do it. I hope so. I haven't tried this, since I just about never go to Starbuck's, but if I can remember, I'll try it, and update with whether I am successful, or not. Starbucks Economics: Solving the mystery of the elusive "short" cappuccino. Here's a little secret that Starbucks doesn't want you to know: They will serve you a better, stronger cappuccino if you want one, and they will charge you less for it. Ask for it in any Starbucks and the barista will comply without batting an eye. The puzzle is to work out why. The drink in question is the elusive "short cappuccino"—at 8 ounces, a third smaller than the smallest size on the official menu, the "tall," and dwarfed by what Starbucks calls the "customer-preferred" size, the "Venti," which weighs in at 20 ounces and more than 200 calories before you add the sugar. The short cappuccino has the same amount of espresso as the 12-ounce tall, meaning a bolder coffee taste, and also a better one. The World Barista Championship rules, for example, define a traditional cappuccino as a "five- to six-ounce beverage." This is also the size of cappuccino served by many continental cafés. Within reason, the shorter the cappuccino, the better. We all have our disagreements with President Bush. Immigration, U.S. Attorney firings, Iraq, Darfur , etc., are all hot topics these days. The following "speech" was written recently by an ordinary Maineiac [a resident of the People's Republic of Maine]. The reason I'm quitting is simple. I'm fed up with you people. I'm fed up because you have no understanding of what's really going on in the world. Or of what's going on in this once-great nation of ours. And the majority of you are too lazy to do your homework and figure it out. Let's start local. You've been sold a bill of goods by politicians and the news media. Polls show that the majority of you think the economy is in the tank. And that's despite record numbers of homeowners, including record numbers of MINORITY homeowners. And while we're mentioning minorities, I'll point out that minority business ownership is at an all-time high. Our unemployment rate is as low as it ever was during the Clinton administration. I've mentioned all those things before, but it doesn't seem to have sunk in. Despite the shock to our economy of 9/11, the stock market has rebounded to record levels and more Americans than ever are participating in these markets. Meanwhile, all you can do is whine about gas prices, and most of you are too stupid to realize that gas prices are high because there's increased demand in other parts of the world, and because a small handful of noisy idiots are more worried about polar bears and beachfront property than your economic security. We face real threats in the world. Don't give me this "blood for oil" thing. If I were trading blood for oil I would've already seized Iraq's oil fields and let the rest of the country go to ... . And don't give me this 'Bush Lied; People Died' crap either. If I were the liar you morons take me for, I could've easily had chemical weapons planted in Iraq so they could be 'discovered.' Instead, I owned up to the fact that the intelligence given to me by the previous administration was faulty. Let me remind you that the rest of the world thought Saddam had the goods, same as I did. Let me also remind you that regime change in Iraq was official US policy before I came into office. Some guy named 'Clinton' established that policy. Bet you didn't know that, did you? You idiots need to understand that we face a unique enemy. Back during the cold war, there were two major competing political and economic models squaring off. We won that war, but we did so because fundamentally, the Communists wanted to survive, just as we do We were simply able to outspend and out-tech them. That's not the case this time. The soldiers of our new enemy don't care if they survive. In fact, they want to die. That'd be fine, as long as they weren't also committed to taking as many of you with them as they can. But they are. They want to kill you, and the fools are all over the globe. You should be grateful that they haven't gotten any more of us here in the United States since September 11. But you're not. That's because you've got no idea how hard a small number of intelligence, military, law enforcement, and homeland security people have worked to make sure of that. When this whole mess started, I warned you that this would be a long and difficult fight. I'm disappointed how many of you people think a long and difficult fight amounts to a single season of "Survivor." In this day and age, it's easy enough to find the truth. It's all over the Internet. It just isn't on the pages of the New York Times or on ABC or NBC News. But even if it were, I doubt you'd be any smarter. Most of you would rather watch "American Idol". So I quit. I'm going back to Crawford. I've got an energy-efficient house down there (Al Gore could only dream) and the capability to be fully self-sufficient. No one ever heard of Crawford before I got elected, and as soon as I'm done here pretty much no one will ever hear of it again. Maybe I'll be lucky enough to die of old age before the last pillars of America fall. Oh, and by the way, Cheney's quitting too. That means Pelosi is your new President. You asked for it. So that's it. God bless what's left of America. Some of you know what I mean. The rest of you, get a life. 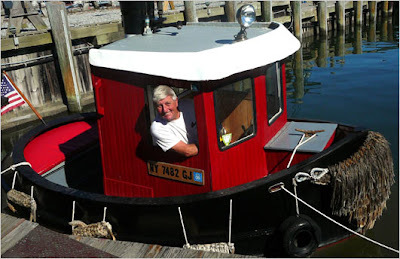 In case you should see this tiny tugboat in the harbor at Greenport, NY, and wonder about it, here's the story. Granulocytes. Never heard of them. But they may turn out to be very valuable, if this research pans out. Cancer sufferers could be cured with injections of immune cells from other people within two years, scientists say. US researchers have been given the go-ahead to give patients transfusions of “super strength” cancer-killing cells from donors. Dr Zheng Cui, of the Wake Forest University School of Medicine, has shown in laboratory experiments that immune cells from some people can be almost 50 times more effective in fighting cancer than in others. Dr Cui, whose work is highlighted in this week’s New Scientist magazine, has previously shown cells from mice found to be immune to cancer can be used to cure ordinary mice with tumours. The work raises the prospect of using cancer-killing immune system cells called granulocytes from donors to significantly boost a cancer patient’s ability to fight their disease, and potentially cure them. The US Food and Drug Administration (FDA) last week gave Dr Cui permission to inject super-strength granulocytes into 22 patients. Dr Cui said: “Our hope is that this could be a cure. Our pre-clinical tests have been exceptionally successful. “If this is half as effective in humans as it is in mice it could be that half of patients could be cured or at least given one to two years extra of high quality life. Found at Instapundit, who says it's probably over-optimistic. Cancer research does seem to be one great breakthrough after another, yet people keep dying of it. I even heard a conspiracy theory voiced the other day: "I think they have found the cure for cancer, but only certain ones receive it." Those would be the ones whose cars have the 100 mile per gallon carburetor. Will the people who have the super-strength granulocytes be allowed to sell them? How many does it take for a cure? Will a rate be set by the government, or will it be more like blood donations are now? Once a super-strength granulocyte donor is identified, how will his or her life change? Will these donors be rock stars, or property of the state? If we get one of these nationalized health care plans that the candidates are talking about, my bet is on the latter. Russian super-bomb won't hurt the environment. Uh, what? MOSCOW (AP) — The Russian military has successfully tested what it described as the world's most powerful non-nuclear air-delivered bomb, Russia's state television reported Tuesday. With a blast radius of 990 feet, that's a circular area of over 70 acres that's going to be hurt. And I suspect some damage might be noticeable even a little further from the center of the blast. Do NOT take an iPhone out of the US! BY RICHARD J. DALTON, JR.
Jay Levy and his family took their iPhones on a Mediterranean cruise. Now the Hewlett Harbor entrepreneur feels as if he got taken for a ride, receiving a 54-page monthly bill of nearly $4,800 from AT&T Wireless. While Levy, his wife and his daughter were enjoying the trip, and even while they were sleeping, their three iPhones were racking up a bill for data charges. The iPhone regularly updates e-mail, even while it's off, so that all the messages will be available when the user turns it on. Tom Snyder chats with Durk Pearson and Jerry Pournelle. My word doesn't Durk Pearson look goofy in that freeze-frame! But we all looked goofy in the 70's. Tom Snyder has a cigarette, Jerry Pournelle a pipe, throughout. I don't think there's a TV studio today that even has an ashtray in it. Left lane cruisers should be shot. If you're not going to pass, get back in the right hand lane. It sounds like a conspiracy theory out of a bad Hollywood movie – but it's real. Husain Haqqani, head of Boston University's Center for International Relations and a former Islamic radical, confirms that the Brotherhood "has run most significant Muslim organizations in the U.S." as part of the plan outlined in the strategy paper. The HLF trial is exposing for the first time how the international Muslim Brotherhood – whose Palestinian division is Hamas – operates as a self-conscious revolutionary vanguard in the United States. The court documents indicate that many leading Muslim-American organizations – including the Council on American-Islamic Relations, the Islamic Society of North America (ISNA) and the Muslim American Society – are an integral part of the Brotherhood's efforts to wage jihad against America by nonviolent means. This has got to stop. Six years after 9/11, we're still asleep. Islamic radicals have declared war on us – and some are fighting here in what looks like a fifth column. Read their strategy document. It's there in black and white, for those with eyes to see. Dreher's article does not link to the actual document, but a minute's work with Google finds it at the Nine Eleven Finding Answers Foundation site. It's a PDF that starts out in Arabic, but is translated after the Arabic pages are done. The process of settlement is a "Civilization-Jihadist Process" with all the word means. The Ikhwan must understand that their work in America is a kind of grand Jihad in eliminating and destroying the Western civilization from within and "sabotaging" its miserable house by their hands and the hands of the believers so that it is eliminated and God's religion is made victorious over all other religions. Without this level of understanding, we are not up to this challenge and have not prepared ourselves for Jihad yet. It is a Muslim's destiny to perform Jihad and work wherever he is and wherever he lands until the final hour comes, and there is no escape from that destiny except for those who chose to slack. But, would the slackers and the Mujahedeen be equal. That bit about "destroying the Western civilization" is really all I need to hear. I'm kinda fond of Western civilization. It was relatively simple for Charles Martel and Jan Sobieski: they faced armies, and could fight them on the battlefield. Dispatches from this trial should be on the front page of every newspaper in America. I don't see it in my town; do you, in yours? Update: Rod Dreher has a blog called Crunchy Con at Beliefnet. There is some discussion in comments there (one post, another) but it's getting sidetracked away from the topic of conspiracy to overthrow the government (and the civilization!) by commenters who see, or prefer to talk about, religious discrimination. Update: More on the trial at the Dallas Morning News: Muslim Brotherhood's papers detail plan to seize U.S.
Update: Holy Land Foundation mistrial. If I link this here, I might be able to remember the names of these symbols. Until this morning, when I came across its name while researching something entirely unrelated, I never knew that the paragraph symbol — ¶ — is called a "pilcrow." That strikes me as an important but small piece of information that is unlikely to ever be useful, but I shall nevertheless try to remember it. However, this leaves me feeling intellectually unsatisfied. Is there a comparable name for the section symbol — §? There are comments, but no answer to the question about a name for the section symbol, or as I have heard it called, division mark. A rather amazing article on punctuation, focusing on quotation marks, is here. No idea how long it will last. Ampersat? You've seen it: @. Update: More of these! A discussion of swearing comics style leads to naming of signs. Sometimes the news makes it seem like the roast beef of Old England has turned to custard. Instapundit, for the hat trick, finds a sensible article about gun control in the London Times. the findings of the International Crime Victims Survey (published by the Home Office in 2003), indicating that we now suffer three times the level of violent crime committed in the United States; never mind the doubling of handgun crime in Britain over the past decade, since we banned pistols outright and confiscated all the legal ones. We are so self-congratulatory about our officially disarmed society, and so dismissive of colonial rednecks, that we have forgotten that within living memory British citizens could buy any gun – rifle, pistol, or machinegun – without any licence. When Dr Watson walked the streets of London with a revolver in his pocket, he was a perfectly ordinary Victorian or Edwardian. Charlotte Brontë recalled that her curate father fastened his watch and pocketed his pistol every morning when he got dressed; Beatrix Potter remarked on a Yorkshire country hotel where only one of the eight or nine guests was not carrying a revolver; in 1909, policemen in Tottenham borrowed at least four pistols from passers-by (and were joined by other armed citizens) when they set off in pursuit of two anarchists unwise enough to attempt an armed robbery. We now are shocked that so many ordinary people should have been carrying guns in the street; the Edwardians were shocked rather by the idea of an armed robbery. Bloomberg and Brady should read this too.